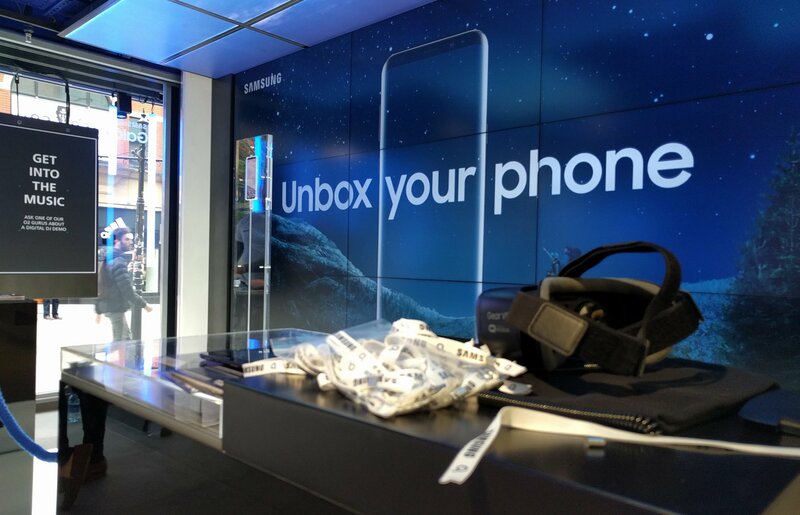 We supported O2 and Samsung with the launch of the iconic Samsung S8 earlier this month, and I made the trip up to Manchester Market Street to experience the activity first hand. The 3 and a half hour journey was definitely worth it just to see one of two Store’s of the Future from O2. The VR setup, project mapping across the workstations and the whole layout of the store creates a welcoming yet advanced atmosphere where you feel you’re going to learn something. As soon as I walked in the store I was offered an O2 and Samsung branded cupcake, a simple yet effective method of drawing potential customers in. Countless times I saw the general public walking past the store and being drawn to the cake, it’s just natural, isn’t it! Once you sit down at the workbenches the project mapping instantly grabs your attention with an animation of a rabbit and engaging text. You’re encouraged to relax and enjoy your time in the store, complete any tasks you have in a cool environment. The main activity got underway around 2PM, with a live band playing in the Manchester Market Street store, and DJs/Rappers performing in the London Westfield store. The band performed a variety of songs including their own as well as covers, emphasising the entertainment features of the Samsung, all going on whilst customers came in and experienced the Virtual Reality. The band were a head turner, the one store on the high street grabbing all the attention, and the cupcakes were still a pretty decent pull. T-shirts and exclusive wristbands were offered to those that tested out the new S8, offering those added incentives that O2 are known for so it all tied back to the brand. It was ideal for me to experience what our client services team do on a daily basis, allowing for full digital coverage for the agency and exploring the features Facebook offers, including Facebook Live. What better way to introduce Facebook Live to our digital strategy than filming a band from one of our experiences? There’ll be more blogs like this as we get out and about to show you how our ideas are taken to store to provide unforgettable experiences.